Allow me to introduce you to what may just become your new favorite way to start the day at noon: hashbrown tartlets and cheesy herb drop biscuits. It reminds me of one of my all-time favorite TV shows, “Friends.” (For those of you who don’t recall, Jon Lovitz guest-starred in an early episode and wore the word out in a very humorous fashion. Video below for your viewing pleasure). Whateva whateva. I do what I want. Remember when Jon Lovitz was Monica’s stoned almost-employer? Anyhoo, the cool thing about these crustless mini quiches tartlets is that they’re very customizable. You can throw in any veggies, herbs or faux meats you have sitting around. My favorites so far are the fresh chopped dill and mushrooms version, the veggie sausage, red onions and spinach combo (below) and the green pepper and soyrizo version pictured above. You could also add a little Daiya or Teese for some extra cheesetastic oomph. Preheat your oven to 350 degrees and grease your ramekins (or 9″ pie dish). Break up the veggie sausage into the skillet, add in the red onions, and cook until the sausage is browned and the onions are soft. Remove from heat. To make your eggy casserole base, start by taking the drained tofu for a spin in a blender or food processor until it’s broken up into small crumbles. Start slowly pouring the almond milk into the liquid feeder, until the mixture is the consistency of frosting. Add in the nutritional yeast, salts, herbs and spices, and pulse a few times until it’s all combined. Dump the lot into a large mixing bowl, and add in the sausage and onions, shredded potatoes and spinach. Once the mixture is well combined, scoop equal portions into your ramekins and smooth the tops with a spatula. Place the ramekins on a foil-lined cookie sheet and bake uncovered for 35 to 40 minutes. 45 to 50 if you’re using a pie plate. Let the tartlets cool for before serving. Preheat the oven to 475 degrees and line a cookie sheet with parchment paper. Combine the melted butter (or oil) and milk in a separate little bowl, then slowly stir into the flour mixture until just combined. Be sure not to over mix, as your biscuits won’t be as fluffy! Don’t worry, the dough is supposed to be super sticky. Space eight little equally sized lumps of dough onto the cookie sheet and bake at 475 for 10 minutes, then lower the temperature to 400 and bake for another five minutes (until the biscuits are starting to brown on top). The day after your successful brunchapalooza (or later that day), just slice a biscuit in half and top it with a half tarlet popped out of a ramekin. You can also freeze them and heat them up later (thaw then wrap them in foil and bake at 350 for 10 to 15 minutes). Dip away, my dears. Dip away. This is real. And I’m so happy for all of us. I was wandering through a book store in Astoria not long ago, when I happened upon this gem: “Betty Goes Vegan” by Annie and Dan Shannon. Now, on account of recently moving across the country and having to re-buy pretty much everything a house needs, I’m broke. So I didn’t actually purchase the book just then (but I assure you all, I certainly will). However, I did, while flipping through its magical pages, discover a dish I thought was out of my grasp forever when I gave up animal bits: the dippity fried egg. You may know them as simply “over easy” or “sunny side up” eggs. But when I was growing up, on the rare occasions when my father would cook the only meal he ever cooked for us (breakfast), he usually made us fried eggs with ever-so-slightly pink yolks — perfect for little rugrats to dip toast into. We loved them and dubbed them dippity eggs. And dippity eggs they will forever be. As you can probably imagine, I was beyond stoked to find this recipe. I may or may not have skipped across the shop, shoved the book up to Miles’ nose and said the phrase, “lookey lookey!” Despite my lack of funds, I had to get these non-eggs into my belly ASAP. 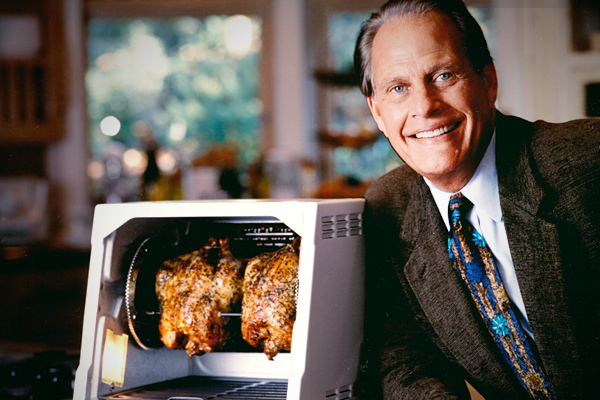 Ron and his rotisserie got me through quite a few bouts of insomnia once upon a time. Not pictured: Flavor injector. Annie and Dan’s recipe calls for a flavor injector, a slightly wacky device that some of you might recall from the late-night countertop rotisserie commercials starring Ron Popeil. I know I do. Only instead of pumping a bird’s carcass full of marinade, the Shannons use this little doohickey to pump their yolk replacement (a vegan cheese sauce) into the middle of a tofu block. Ingenious. Unfortunately, while I’ve placed an order for my very own flavor injector (of course), I was not patient enough to wait for it to arrive before attempting these tofeggs. 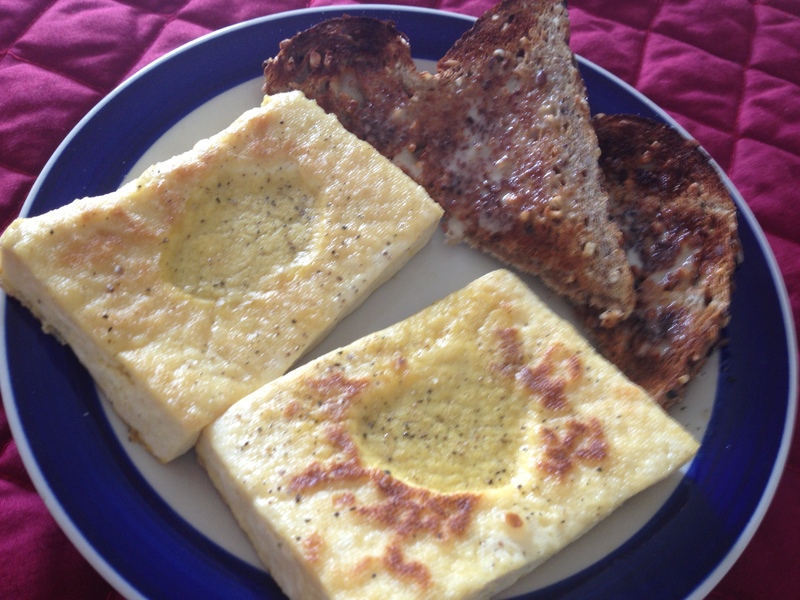 Instead, I scraped out a couple little craters in my pressed tofu blocks, and filled them with my own yolk sauce (recipe and instructions below). And, my friends, I was not disappointed. I think the key to the yolk sauce success is black salt. While not aptly named (it’s really more of a reddish brown), it’s eggy, sulfurous smell and taste are pretty much perfect for this application. 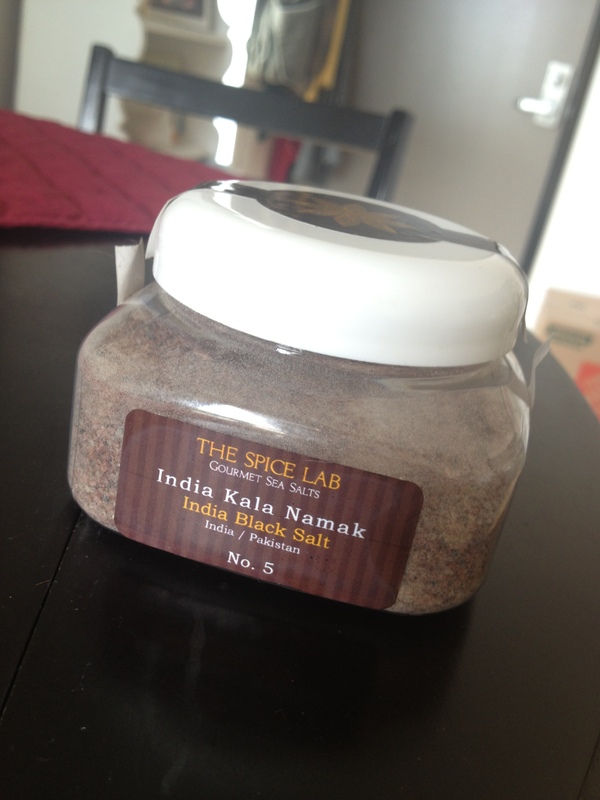 I got mine off of Amazon, but you might be able to unearth some at an Indian market or health foods store. In fact, my little dippity tofeggs were amazing, and now that I have a ready supply of yolk sauce, I plan to make them all the time. I hope you like ’em too! To make the sauce, place all the ingredients (minus the tofu, naturally) in a blender or food processor and pulse until you have a smooth liquid. You’ll have some left over. Store that in an airtight container in the fridge for your next batch of fried dippity eggs. Two little tofeggs, getting ready for the skillet. And, also, a little bit of my thumb. My bad. Get Ready to Get Dippity! Cut your block of pressed tofu into thirds, set one third aside for other use, and then cut the leftover two blocks in half, length-wise. 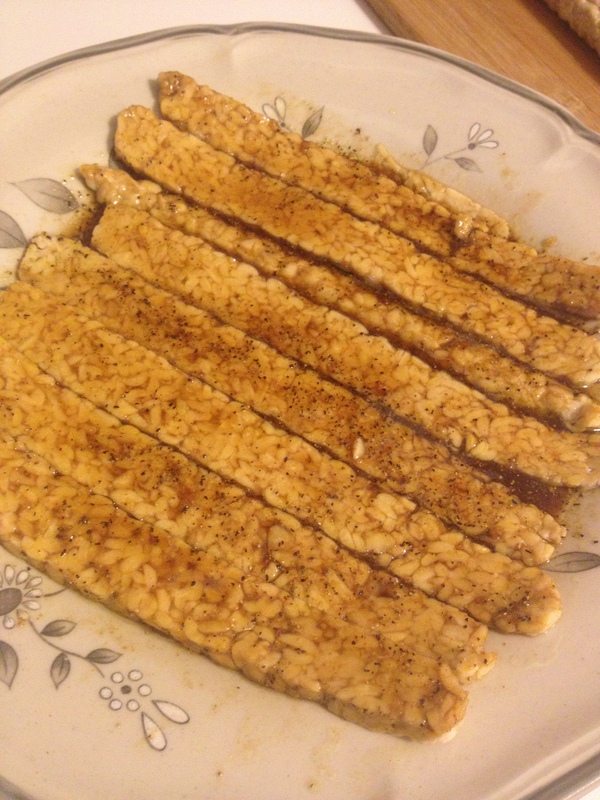 What you want in the end is four rectangles of tofu that are roughly the size of a fried agg and about 1/2-inch thick. 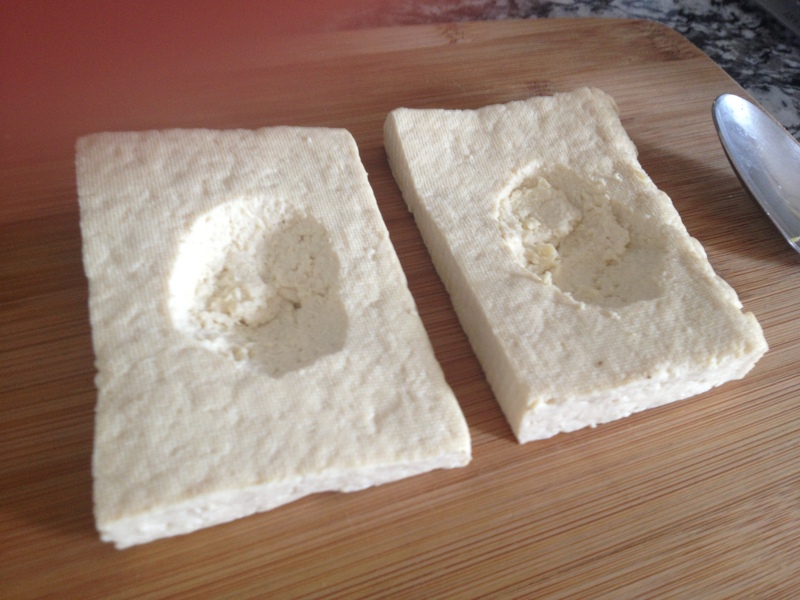 Take a spoon and carve out little yolk craters on each of the tofu blocks. Be careful not to dig through the tofu, or your yolk sauce will escape! Heat the olive oil on medium heat in a cast-iron skillet until it crackles when you toss a drop of water in. Then fry your tofeggs, flipping over occasionally until they start to brown and crisp. Sprinkle the tofeggs with a pinch of black salt. Now, spoon some of your yolk sauce into crater of each egg, and place the skillet on the bottom rack of the oven for about three minutes to set the “yolks” up. Scoop them out of the pan and onto a plate, and serve with some toast for dipping! I could eat breakfast food for every meal and be the happiest of campers. Songs of joy would emanate from my metaphorical tent. And one of my favorite dishes is a big ole plate of biscuits smothered in gravy. Fortunately for me, and unfortunately for my wallet, I live about 15 minutes from both Chicago Diner (“meat-free since ’83”) locations, which serve up some magically delicious brunch items all week long — including to-die-for biscuits and gravy. From the lovely pages (27 to be precise) of their cook book comes this biscuit recipe, which I quartered to make five biscuits instead of 20. I know what you’re thinking and, sure, I could have frozen the leftovers. But would I have? Or would I have eaten all 20 and then fallen into a lengthy food coma? I think we all know the answer. Anyway, for those of you with self control, here’s the recipe for all 20 glorious biscuits. 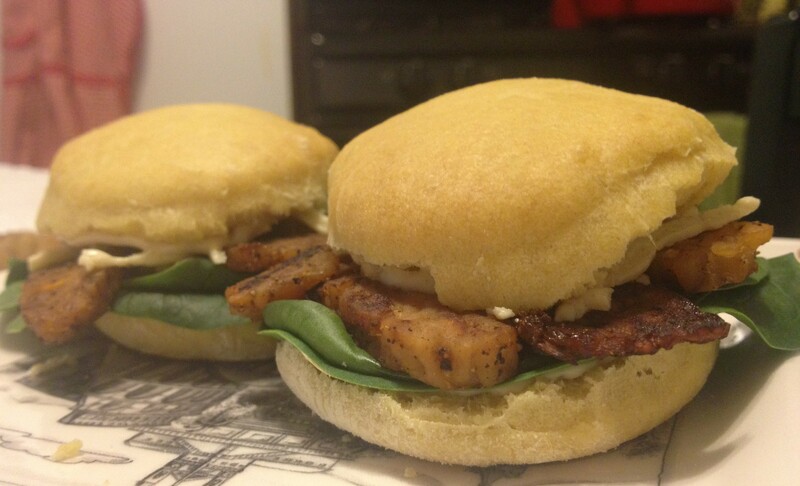 One change: I used whole wheat flour versus standard unbleached because I am a damn rebel. 11/2 sticks vegan butter (or 12 Tbsps. I did the math. You’re welcome). Mix together your three dry ingredients in a large mixing bowl, then stir in the butter with a fork until there are little clumps. Add the milk, lemon juice (or vinegar) and stir until you have a knead-able lump of dough. Plop your dough lump onto a floured cutting board or counter, and knead it for one or two minutes, until the dough is smooth. With a rolling pin (or wine bottle), roll the dough out until it’s a half-inch thick. Use a cookie or biscuit cutter (or juice glass, if you’re me) to cut out your biscuits. 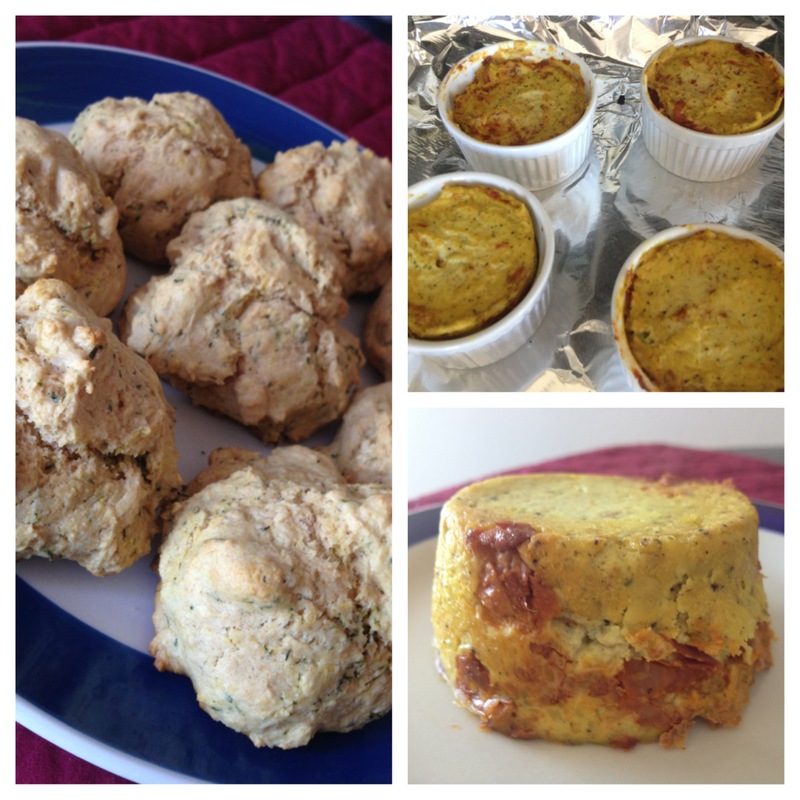 Place the biscuits on a cookie sheet covered in parchment paper, and pop them in the oven for 12 to 15 minutes. You’ll probably have a little bit of dough leftover. Mold that into a biscuit-like shape, and include it on the cookie sheet with its more attractive brethren. Also, name it something cute so it feels better about itself. I recommend Scooter. When they’re all done, place the little guys in a bowl, and cover them with a towel to keep them warm. For the gravy, I used this out-of-sight and too good to be true recipe from the Vegan Fusion cookbook, with a few alterations, including that I once again used whole wheat instead of unbleached flour. Like I said — damn rebel. This makes four cups. Make the roux by mixing the flour, olive oil and water in a small bowl until it makes a thick paste. Then set the roux aside for later. Using the rest of the olive oil, sauté the onion and garlic in a medium skillet or sauce pan for two minutes on medium heat, stirring occasionally. Add in the mushrooms to the onion and garlic and sauté for two more minutes, stirring occasionally. Stir in the broth, soy sauce, nutmeg and cayenne and cook for two more minutes on low heat, stirring occasionally. Scrape in your roux paste and cook the whole mixture until the gravy is thick, about 10 minutes. Make sure to stir it frequently so it doesn’t burn. If you want to thicken up the gravy more, just sprinkle in some more flour — but make sure to whisk it in well so it’s not clumpy. This dish also, in my experience, is excellent alongside some tofu scramble with sautéed mushrooms, red onion and green pepper. Plus the leftovers store nicely in the fridge for a few more delicious breakfasts. I made this for breakfast, and it was delicious! 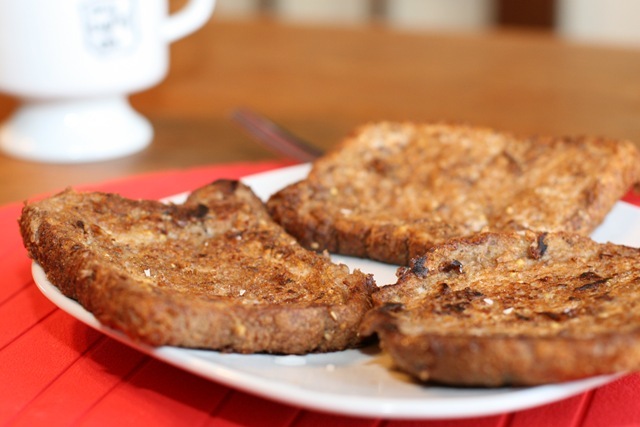 In medium bowl whisk together flour, nondairy milk, maple syrup, vanilla, cinnamon, and salt.Slice bread into ¾” thick slices. Heat the oil in a large skillet. Submerge one slice of bread in to the batter making sure to coat both sides. Put in to the hot skillet and brown on both sides. Repeat with each slice of bread.